The Shepherding Ministry section of this site suggests a number of venues where shepherding might take place with Sunday School being one of them. To be effective shepherds, Sunday School teachers need to build relationships with students which begins with getting to know them. 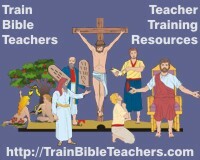 Sunday School teachers must take time to get to know the students to effectively shepherd them. Teachers who build relationships with their students move into incarnational teaching, the best way to get to know the condition of the sheep. Jesus came to earth, where mankind lived, to put truth into human form. Teachers, likewise, will best communicate truth when they are willing to go into the worlds of their students. Teaching truth within the context of relationship will have the greatest impact and enable you to effectively minister to them. You will get to know the needs of individuals better. You will start to see students as whole people, not merely as spiritual entities to teach. When students sense that the teacher cares about them and that their needs are being met, they will want to keep coming back and they will want to bring others to share in it. They will tend to be more attentive to what you say and also more cooperative. Invest time and energy into keeping in contact with them. Learn what you can through reading, networking with other teachers, attending seminars, etc.